I think it's safe to say many of us film bloggers, critics, and writers trust IMDB for a great deal of information. It provides us with one of the most comprehensive databases on film and television, along with user reviews, and a centralized point for movie news... for the time being we'll ignore some of their more blatant issues with the top 100. 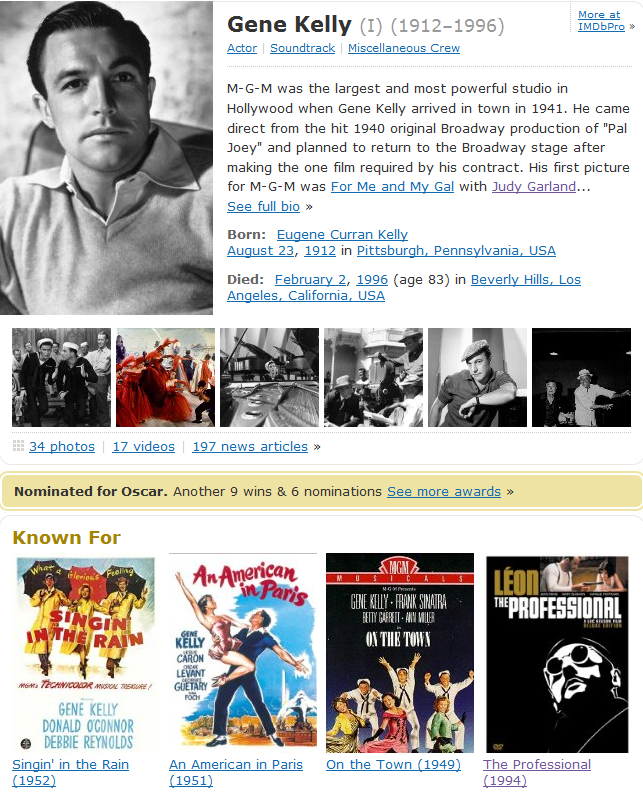 Today I want to talk about one of IMDB's latest features: 'KNOWN FOR.' Basically, this feature siphons out the long, winding list of credits one after the other in order of release year to present you with the FOUR films most associated with the particular individual whose page you're visiting. Well, at least that's the intention. I find very little objectionable about that idea. When you're approaching a particular actor/actress you're unfamiliar with, but wish to be, it can be nice to receive a handy 'greatest-hits' guide to help entice you. Of course, then arises the question: Just how does one calculate someone's 'Known For' films? Well, allow me to enlighten you. The job performed on the title (a credit as director will have more weight than a credit as production assistant). 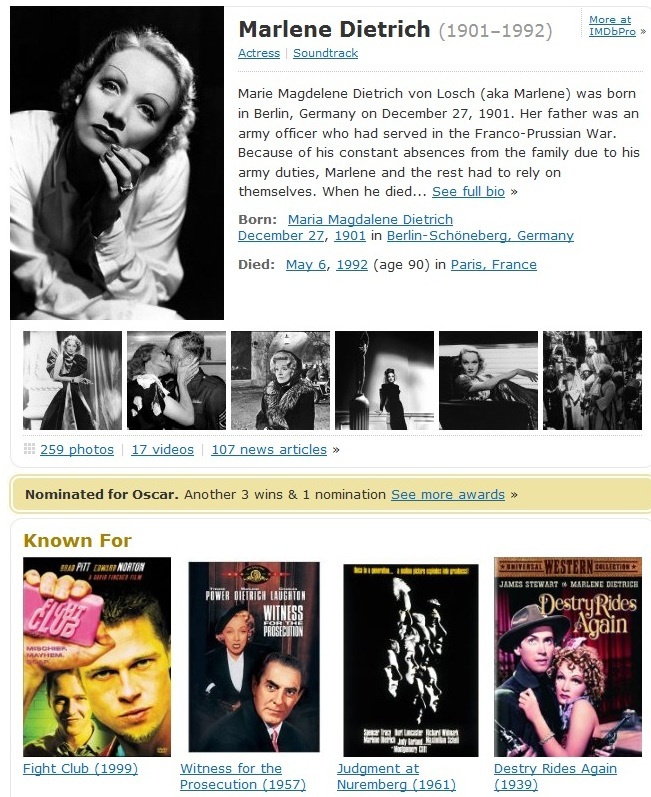 That's right ladies and gentlemen, Marlene Dietrich with over 54 films to her name is best known for FIGHT CLUB. Why? Well, isn't it obvious? When the song No Love, No Nothin' kicked in didn't all 403,000+ voters for Fight Club on IMDB stand up in unison and go 'HOLY *! 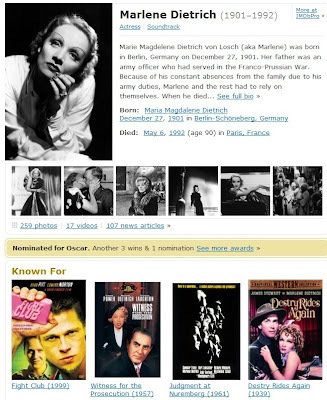 *@ that's Marlene Dietrich.' No? Well, certainly there can be no kinks in IMDB's armor, so it must be some sort of error. I mean, the lists for Bette Davis, Audrey Hepburn, Cary Grant, and James Stewart are rather spot on! This requires further investigation! You see, what these all have in common are 'Soundtracks.' Not always the same song, but the repetitive use of classic songs spawning from their musical days have supplied enough credits to outweigh the number of acting roles they have. Thereby giving them more credence in IMDB's calculations than to the films they actually had a part in, and anyone knows them for. 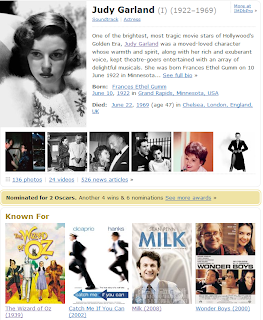 If you want to note Judy Garland was an infamous singer why not just put that instead of films she had nothing to do with, and NOBODY associates with her? I know, it's a far more complex thing to calculate relative applicability than just apply a simple weighing system based on something's current popularity, but you put yourself into this situation. The main issue with IMDB's Known For system, which helps in making it inherently more flawed than the type you find in Wikipedia's articles, is simply that it removes the HUMAN element. Sure, giving precedence to a film more people have seen seems like a perfectly reasonable calculation, but it fails to account for many of the issues currently facing the way Hollywood does billing. I would argue Pete Postlethwaite (RIP!) is far more Known For his role in The Town, Last of the Mahicans, or his Oscar nominated turn in In The Name of the Father, than he is for the rough two minutes he was in Inception. Or that just because Fred Astaire did 60 episodes of the Alcoa Premiere doesn't mean he's remembered more for that than the entire collection of Fred Astaire - Ginger Rogers films (that's right, not ONE Astaire - Rogers production made IMDB's 'Known For'). The fix for this is a rather simple thing: Allow for users to vote on 'Known For.' Much in the same way that they can vote for how much they like a particular film, allow them to vote on how much they associate an actor with a movie. You can do this one of two ways: 1) Allow them to vote up or vote down a movie on that person's resume or 2) Let them vote on each films associative value to that person individually (in fairness I think #1 is easier to code). Another thing IMDB can do is devalue those films which take place after the actor's death. You already disassociate through noting if something was 'archive footage,' why not do it for songs as well? The sheer scale of IMDB's users will easily offset any tomfoolery or lack of relevant knowledge, creating a perfectly acceptable aggregate. Sure, there's going to be a few of the lesser known actors that struggle with maintaining their Known For, but in the long run these things will work themselves out. It's unfortunate, but as of right now your efforts in simplifying things lead to added confusion, and misdirection. I know many of you probably don't care, and only pay marginal attention to the Known For, but think of it in the context of someone visiting the page for the first time. An individual who may just be getting into films and wants to know what they should check out for particularly important historical actors/actresses. It's counterproductive if the system involved in supporting them, ends up hindering them (or wind up being completely useless). What do you think of IMDB's Known For? Do you agree with some of the things I've brought up in this article? Do you care? Ahaha that's a funny observation, I never really paid attention to that feature. Obviously a flawed system and maybe your article will lead to a better one! I've never paid attention to this before. I hope it reminds readers to pay more attention to the info they receive online. Thanks for the informative article! Damn, Ryan, that's a great article. 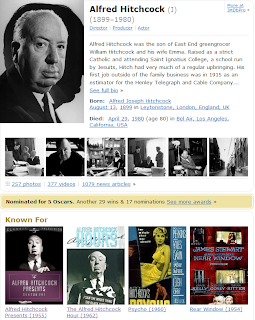 I never noticed such inaccuracies but Dietrich and Garland's "known for" almost killed me. How astute of you Uni! 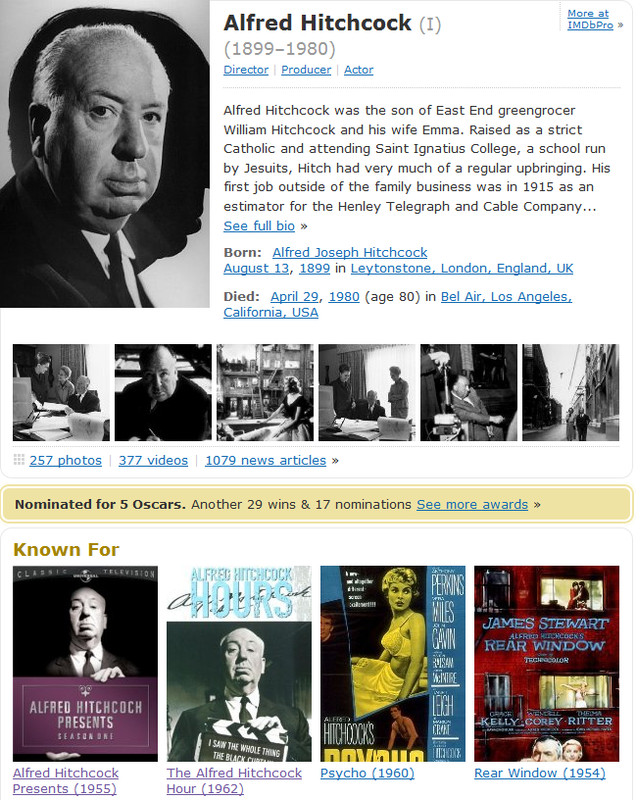 I go to IMDb every day and hardly notice the 'Known For' section. Ha..ha.. that's funny about Dietrich, wow, Fight Club??! Well I'll be darn if this post gets picked on IMDb hit list but it should. As Castor said, hope they'd figure out a better system soon. That is pretty freakin hilarious. Hopefully after some time they will be able to work the bugs out. @Castor Perhaps, but I doubt it. I'm not sure I would even qualify as an atom on IMDB's radar. @snobby Very true, too many people take things they read on the internet at face value. @Lesya Thanks! The truth is these are VERY isolated incidents, but they perturb me never the less. @Flix Thank you. I'm odd in that I pay attention to these things - especially when IMDB changes things on me. I don't care much for change, and if they're going to do it, it better be for widespread improvement. @amy Ah yes, I loved the ending and how he tap danced right through the explosion and carried Mathilda off into the sunset. Great article, I'd noticed some of the "known fors" were a bit wonky but hadn't noticed anything on the scale of what you found. The Fight Club thing made me laugh out loud! Lovely article, but why do you care so much? People already know any actor for a certain thing, the contents of their 'Known for' page isn't going to change their entire perceptions of reality. @Sugary Thanks, I found it rather amusing as well. Though I think my immediate response was shock over laughter. @Simon I mention in the article the main two reasons *cough. * Things like this aren't designed for people like you or me going to the webpages looking up particular items. They're designed for those who know nothing and are seeking a simplified way of approaching an actor or actress' body of work. Also, if they're going to bother having it fill up the page, it ought to work right :). thats hilarious. great post! you should definitely submit that on the imdb hitlist - they would be foolish not to feature it. personally, i dont like the 'known for' feature at all. i actually enjoy the long scroll down through an actor's credits, means you stumble across some youve never heard of amid the more well-known stuff. but thats just me. Great post, I've had similar discoveries looking at Directors, especially lesser known ones. The Known For is flawed, but improving. Already the Judy Garland Known Fors have been rectified, but Gene Kelly is still best known for Leon. I agree, two minutes of screen time in Inception does not compare to an award performance in In the Name of the Father. As yet, AI on IMDb is no match for human judgment and common sense. This is particularly a problem for "character" actor/actresses, where his/her most notable performance might be a smaller role in a less well-known movie. I think the best way to fix this would be to calibrate the top four performances based on which ones are clicked through most often to get to the artist's name. I.e., I might be looking for Bob Balaban as the choir director in Waiting for Guffman, or his role on Seinfeld rather than the listed top performances in Close Encounters, Gosford Park, Ghost World and The Majestic. Another simple way to calibrate would be to give precedent to roles where character pages have been created for them. Hi great Article! I noticed it because I am mainly a script supervisor in the industry but have done some bit parts in movies and for some stupid reason the movies which I did the bit parts in are what I am known for and those movies have lower budgets and are nothing compared to what I did as a script supervisor so I am pretty depressed about the fact that I can't change it. Thanks for writing the article.